Use them in combination's to create one of a kind glassware. Geometric shaped drinking glasses are very popular. Why spend all that money for decorated glasses when you can do it yourself more economically. 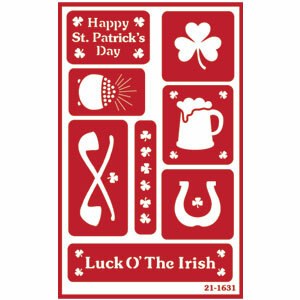 Happy St Patrick's Day: 1.25" x 2.0"
Pot o gold: 1.75" x 1.0"
Crossed pipes: 1.25" x 2.5"
Luck o the Irish: 1.50" x 4.12"
Cup of ale: 2.0" x 1.625"
Horse shoe: 1.25" x 1.25"